Btw...Amazon currently has free shipping for orders of $35 or more. 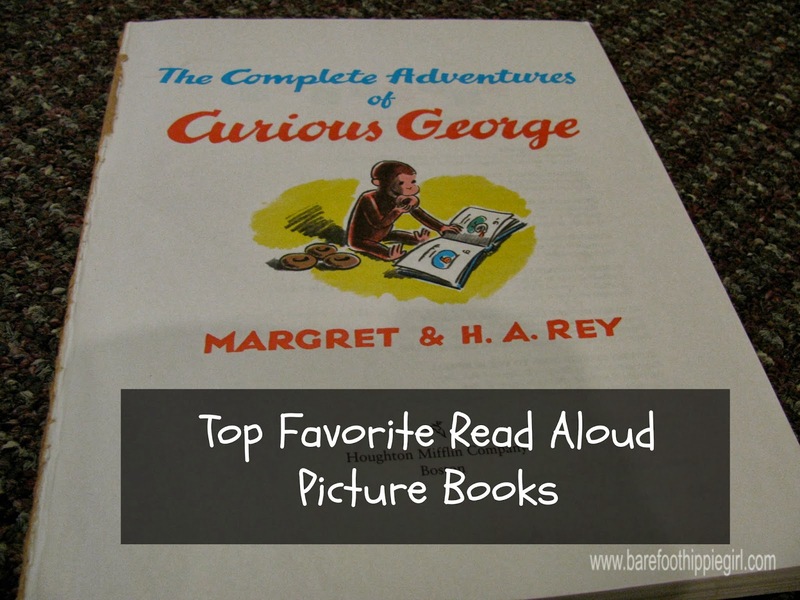 1) The Complete Adventures of Curious George by Margaret and H.A. Rey- We love George's adventures and messes of mischief. So fun! 2) The Little Engine that Could by Watty Piper. You want to get the version illustrated by Loren Long. Gorgeous! 3) Where Do Little Girls Grow? by Milly Jean Limmer. A friend of a friend wrote this book, and we have an autographed copy. The illustrations are very hippie-ish, and sort of weird. But it is a beautiful answer to a little girl's question. 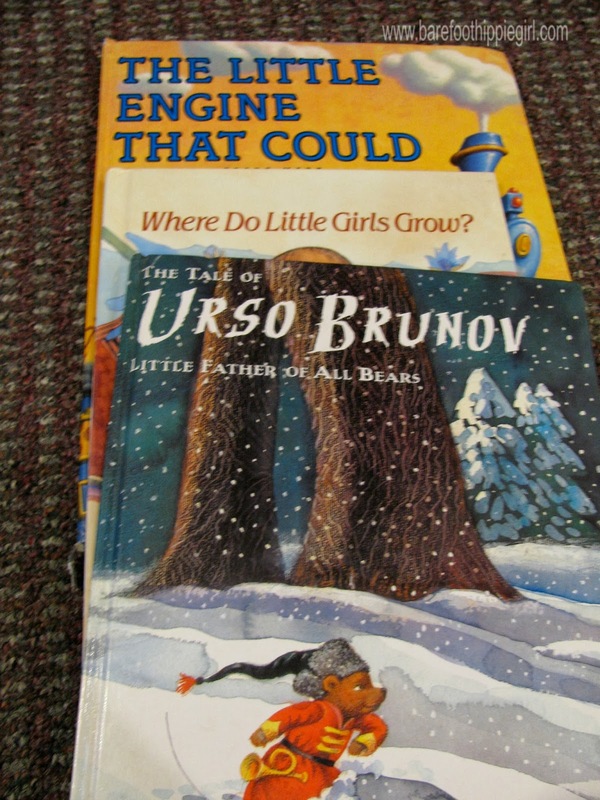 4) Urso Brunov by Brian Jacques. This is a really fun story about a little bear away back when. It is a delight to read. 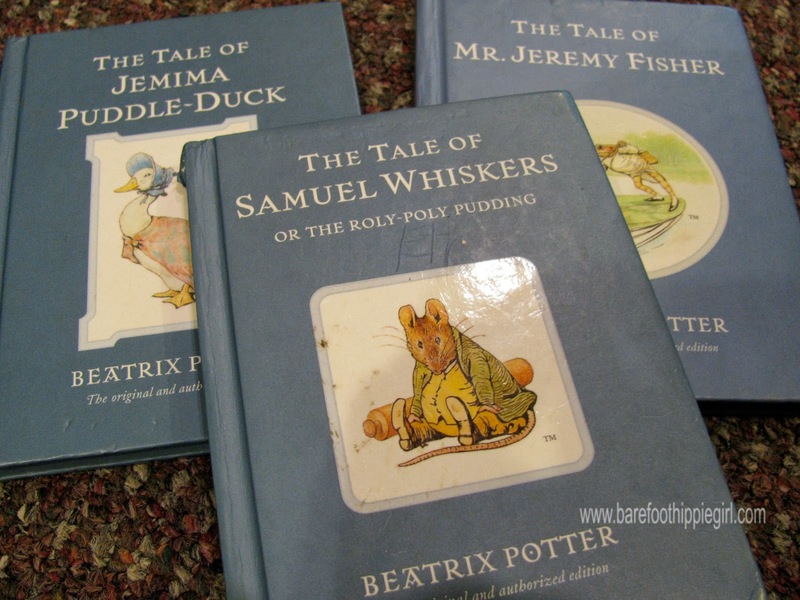 5) The Tales of...by Beatrix Potter. 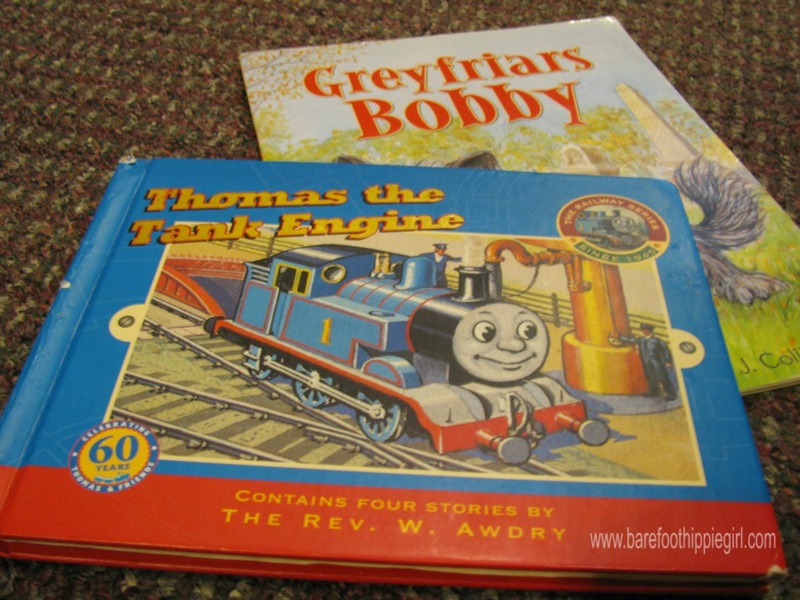 These books are timeless, both the stories and illustrations. I like this particular edition because of the small size. They fit nicely into little hands. 6) Busy, Busy Town by Richard Scarry- what can I say? I am a sucker for his illustrations. 7) Cars and Trucks and Things that Go by Richard Scarry. The fun element in this particular book of Richard Scarry is Mr. Goldbug. He is hidden on every page. 8) Best Mother Goose Ever. I agree! 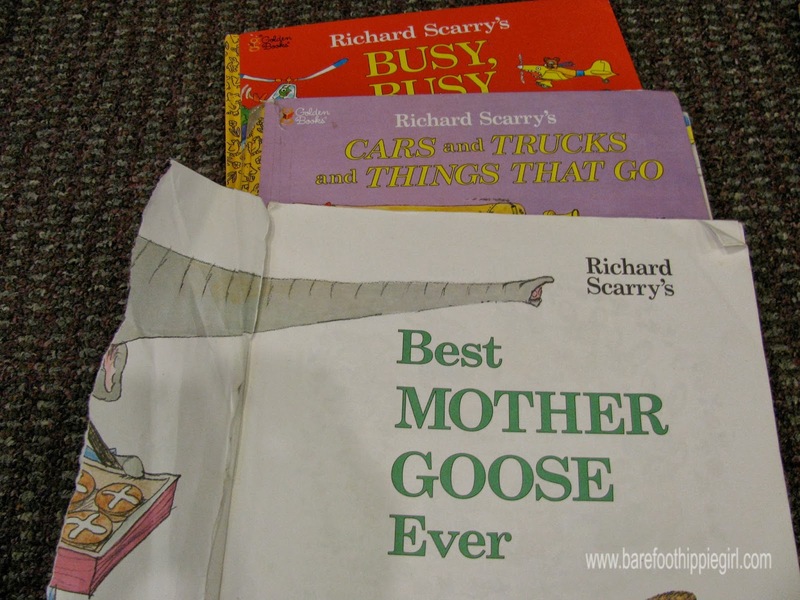 There is no other edition of Mother Goose worth commenting on (in my humble opinion). Richard Scarry's illustrations and take on these rhymes will always be my favorite. 9) Greyfriar's Bobby by David Ross. We actually picked up this book in Scotland at a Kirk gift store for our kids. It is a sweet but sad story of love and loyalty. 11/12) Tales of Young Americans...Scarlet Stocking Spy and The Last Brother. 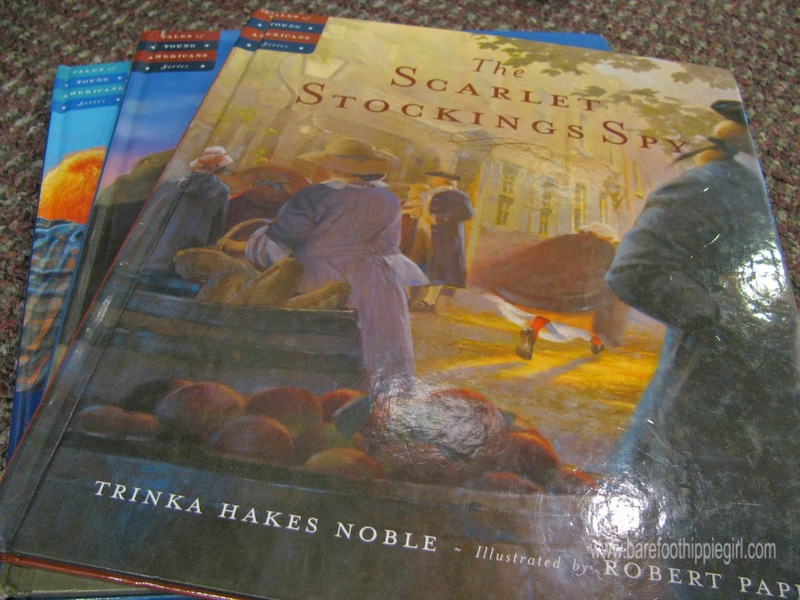 Trina Hakes Noble and Robert Papp make an amazing book team. The pictures are worthy of framing. And the history is very motivating to young minds. 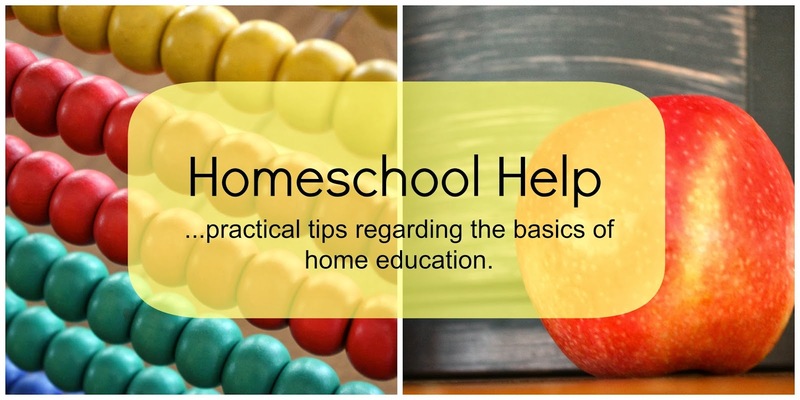 Well, it is Thanksgiving week, and I am taking a blogging break until next Monday or Tuesday. I am in Texas cooking with my mom, enjoying the Dallas Arboretum with my sister and niece and nephews, running a Turkey Trot with Mr. Hippie and just relaxing. I hope you have a wonderful week full of reminders of all you are thankful for.